As part of the Centennial Committee’s work to get us ready to celebrate 100 years as a parish and to move us into the next hundred, they decided to have a modest fundraiser to repair all of the broken and lost tiles in the St. Helen Pavilion, next to the Church. Through this website or the Parish office you can have a personally inscribed tile to be placed permanently within the St. Helen Pavilion. I decided to take the opportunity, instead of waiting, to accomplish something significant for the 100th, to ramp up the fundraiser to include a remodel of the sanctuary. Now, the tile campaign will also support a remodel of the sanctuary. 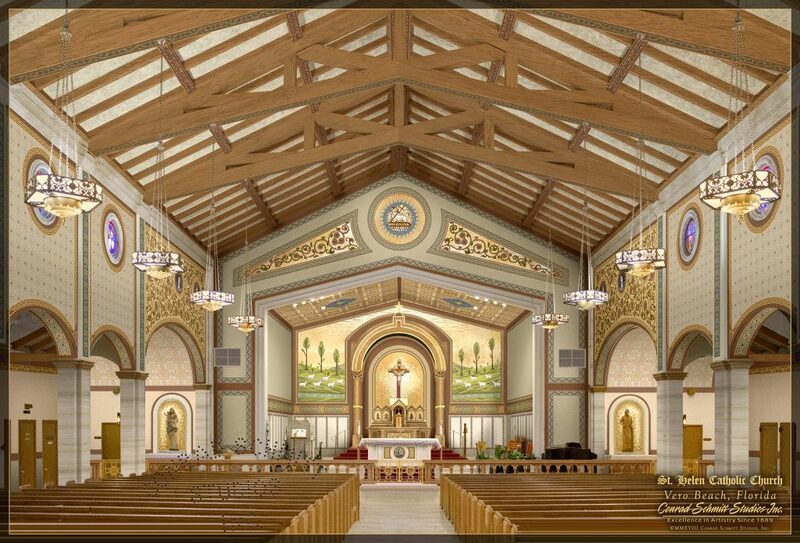 Conrad Schmitt Studios (who have been remodeling in numerous cathedrals around the country, as well as Notre Dame) have proposed a remodel of the Church based on Churches built in the time of St. Helen herself. It involves murals, a new high altar, a baldachinno, and redone lighting. You will be able the view the proposal in the back of the Church and at the Parish office. It is breathtaking, but still within the tradition of St. Helen. To help the project along, one family has given a $250,000 matching gift, which means that every dollar you give to this project, they will match up to $250.000. In addition to any of the regular methods of charitable giving, the second collection on the following weekends will support this cause: November 24/25, December 15/16 and January 19/20. The project will begin February 4th and be completed just before Easter. The sanctuary will be closed off for that time, though Mass will still be in the Church, it will just be a little cozier. Though you see a design for the entire Church, this phase 1 only encompasses the sanctuary. Phase 2 may be encompassed in a capital campaign. People have this idea that St. Helen is a small country parish. It isn’t. It was 100 years ago. Did you know that a Mega Church is categorized as having 2000 members on average. We have 3500 families (which translates into 6-8 thousand people). St. Helen is three Mega Churches in one. We can accomplish many things without due hardship. This is an opportunity! Not a demand. If you can – do. We still have our regular responsibilities to the healthy running of the parish, our outreach to the poor, the DSA, and other necessities. I ask that you not neglect those in favor of this. But this is an unusual chance to make your mark on St. Helen. 100 years ago, that generation made their mark with establishing this parish. Previous generations – what have they made of St. Helen? Schools, convents, new Churches, buying land for the future. What will this generation do? If you like it – take advantage of this opportunity. Donations are being accepted at the Parish Office.